The Vintage Turntable Design is an infusion of traditional and modern technology. It has a music streaming ability with inbuilt Bluetooth. One’s preference for this turntable is enhanced by its compatibility with all the mainstream devices from the core MP3 players to iPhone, Android devices, and tablets. This list is big; you can even connect it to your computer/laptop and listen to internet radio or your music library. It allows for a Vinyl to MP3 recording with an option of sharing in a preferred format. Its stereo speakers are the full range with an input Aux (3.5mm) jack. You can also listen to music from a DVD or any other CD cassette using this great turntable. 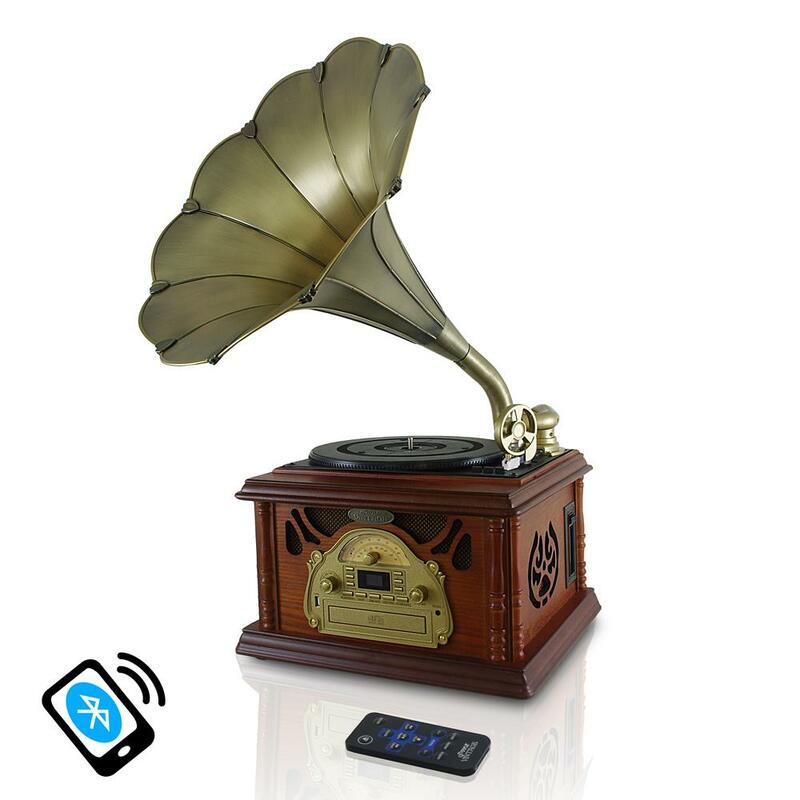 It’s ecstatic listening to music from its Gramophone Phonograph styled like a horn and the visual impact it brings into any room; it is an antique, and one can consider it a piece of furniture. Other additional features are a slot-in cassette deck, USB and flash reader and AM/FM radio. With its specifications, it is almost the best vintage turntable there is. Given its uniqueness, it is best to look at each of its principal components so as to get a crystal clear picture of what to expect from it. 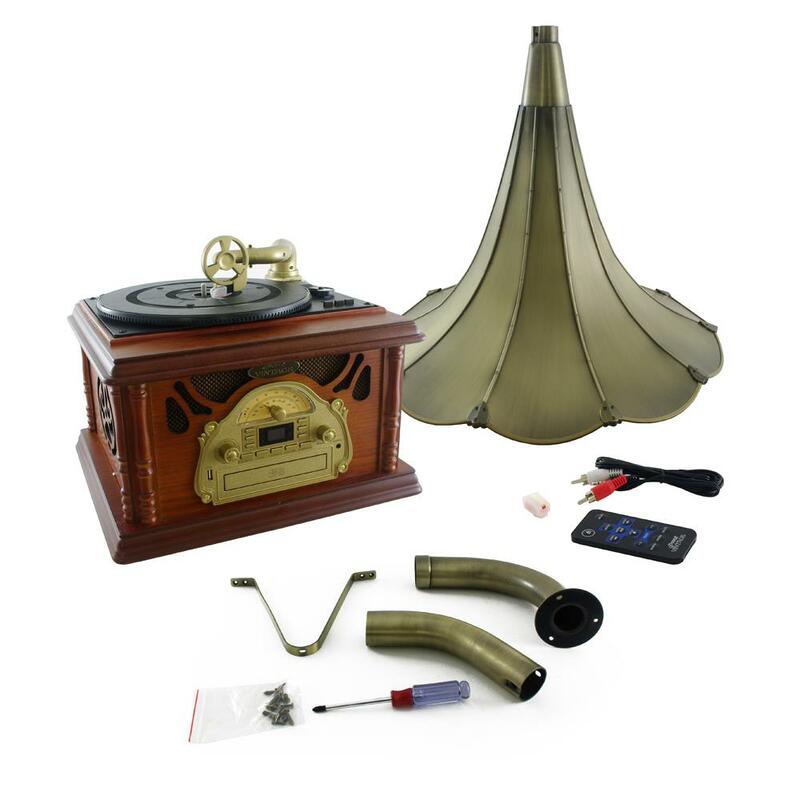 A well carved Acoustic Vintage Horn, a remote control, Aux cable, 45RPM Adaptor, Classy and Well-framed Wood Housing, and A Turntable Motor – this turns off once the record has stopped playing. This great turntable which falls under the category of the best vintage turntable is easy to use with any of your Bluetooth devices. It allows you to stream your content directly from your Bluetooth device. Your house doesn’t need to be a mess with the tens of cables entangled all over the place. Also, with continuous usage of these ports on devices sometimes may lead to wear and tear of the device if one is not careful. From this extensive library, you have on your laptop to the songs you listen to from your smartphone; it is blissful. It’s also effortless listening to music this way compared to always using the cable connectivity. This port allows you to listen to all your best music from any other external device. This can either be a Cassette player, your best CD or a USB flash drive. Given previous formats of music to the current ones, it captures all that by playing all. You don’t have to worry about some music formats on your PC failing to play using it as an external output. Most of the old day music on the vinyl records is now not only restricted to that old format. With the Pyle PTCDCS32BT Retro Vintage, you get that opportunity to convert these records to MP3. It is specialized to the level that it comes with a driver and software that allows you to convert the records into files that can be stored in a computer. The beauty of it is that this comes readily compatible with all PCs and Mac. The inbuilt stereo sound speakers give you that crisp sound that either brings in nostalgia or some euphoric feeling of a studio. Their duality allows for the elimination of the need to always connect devices with other external speakers. A form of self-reliance attribute of this musical instrument. Its speakers instead tempt one to have the system act as an output to other devices. The speakers are small in size, but the output they give will move you. Their ingenuity allows you to listen to music in a unique and phenomenal way. It makes it a pleasant affair. The gorgeous device has a height of 26.2, a length of 21.5 and width of 18.8 inches. It has a total weight of 28.7 pounds. Pyle PTCDCS32BT Retro Vintage test is done after construction as is with all other products before shipment. The warranty will be considered void if the device was accidentally damaged or tampered with. The visual of this audio device is literally gorgeous, it gives the room a great demeanor and pulls off a great Victorian theme in a room. With its gleaming cherry wood, it has a magical way around it. Any light that illuminates the room turns on the reddish outlook on it. The shiny horn is also unique in its own way, it is bright brass and looks very authentic. The great artistic structure of the turntable, with its details, is literally an antique worth keeping. The sound it gives is ecstatic and leaves one on the look out of any opportune time to use it. The unit allows for many options to play your music. 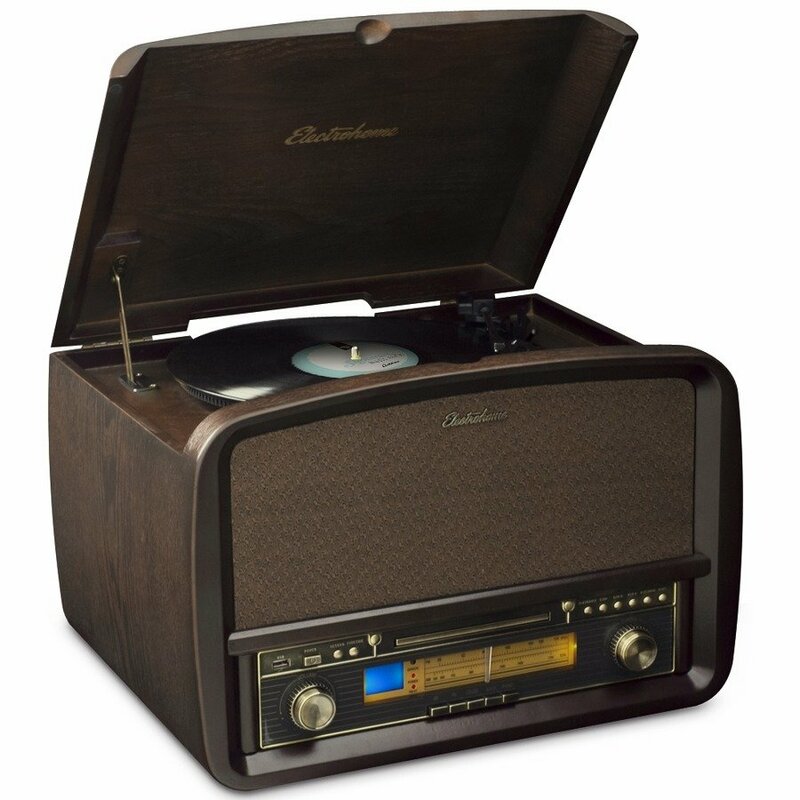 It also helps set up some nostalgic memories as you play those oldies vinyl records. The ports available for the USB and Aux (3.5mm) enable you to enjoy the lovely sound it gives. The combination of aesthetic value and the music you get to enjoy using this turntable can be equated to the over 1000USD phonographs in the market. With its affordable pricing, you get value for your money. The balance strikes between these two variables of structure and applications are only best noted when you acquire it for exactly 305 USD. If you aren’t satisfied with this great Pyle vintage turntable, you can read something about this – also great vintage turntable: Electrohome Record Player Review .